First Flight to Sebastian Airport - - Page 416. First Flight to Sebastian Airport · · PAGE 416. July 4, 2017: A day with the temperature in the mid-80's by the time I arrived at the Rockledge Airport around 10:30 AM. I opened up the hangar when I arrived and got some breeze flowing in the back door and out the hangar doors. My airplane was still in the back at the southeast corner of the hangar. 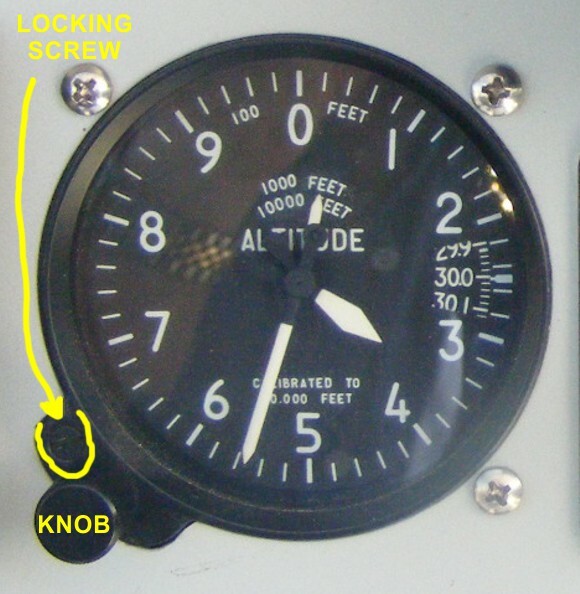 Paul Kollsman was a German immigrant who invented the practical altimeter with the correction factor for local barometric pressure all pilots use in their aircraft. You can learn about him and how his invention helped the USA and our allies in World War II. This is a link to his information on Wikipedia. After I completed the adjustment to this altimeter, I went through the setup routines for my Dynon D-10A and made the same menu adjustments to that important electronic instrument. Both altitude measurements now match each other. After I put away my tools from the altimeter calibrations, I started to move the airplanes out of the hangar. 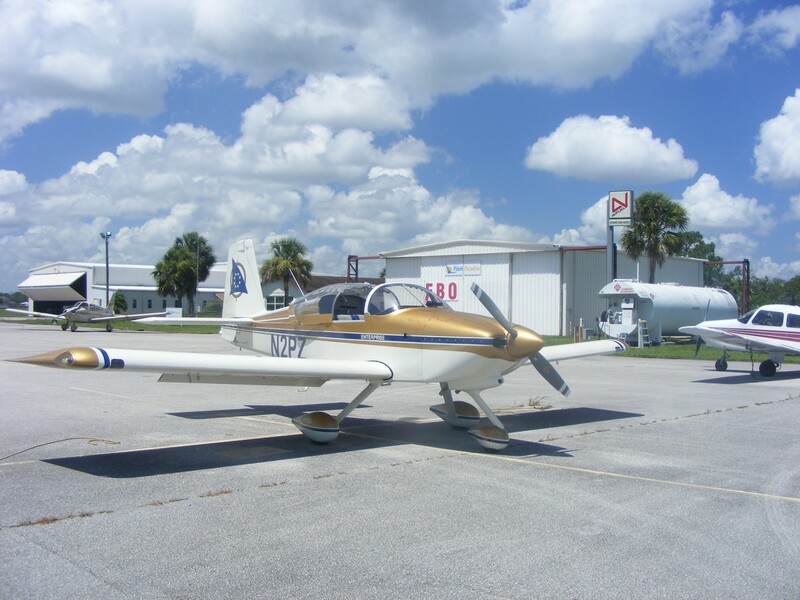 I had to move the Faeta 322 outside before I could move my airplane out to the ramp in front of the hangar. Then I had to move the Faeta back to the corner where my airplane was located. Those long wings required some "wiggle" moves to get to the back of the hangar and clear of the obstacles along the wall and the other Faeta on the other side of the hangar. 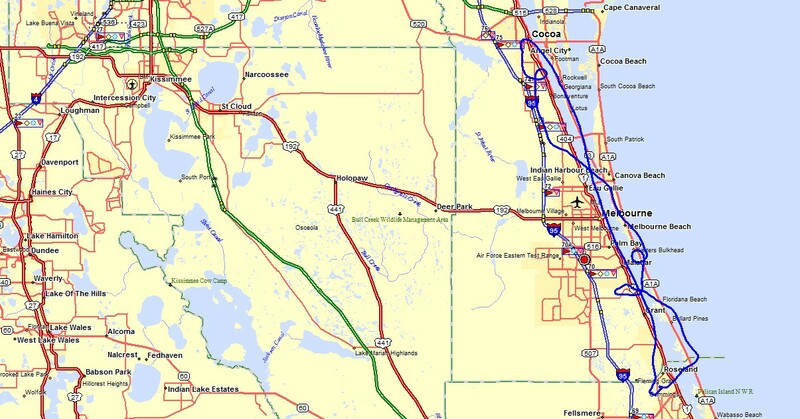 The flight down to Sebastian started with a takeoff on runway 36 and a turn down the river before coming over the mainland over toward I-95. I climbed to the altitude I needed to clear the Class D air space for Patrick Air Force Base and the Melbourne Airport as I headed back down the Indian River. I engaged my auto pilot to see that it was working. There were some clouds over the mainland at my altitude of 3,500 MSL as I flew south. I stayed over the water to remain in VFR conditions. As I approached the Sebastian Airport, I was listening to the Unicom frequency to know which of the two runways is in use. 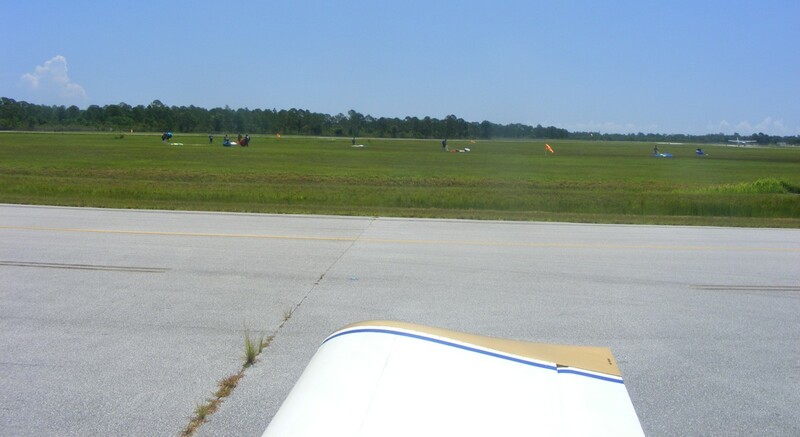 I taxied to the ramp and parked my airplane near the FBO and the parachute jumping office as this place has a lot of skydiving activity from 14,000 feet. I got out of my seat and sat on the left canopy rail to take some photos. 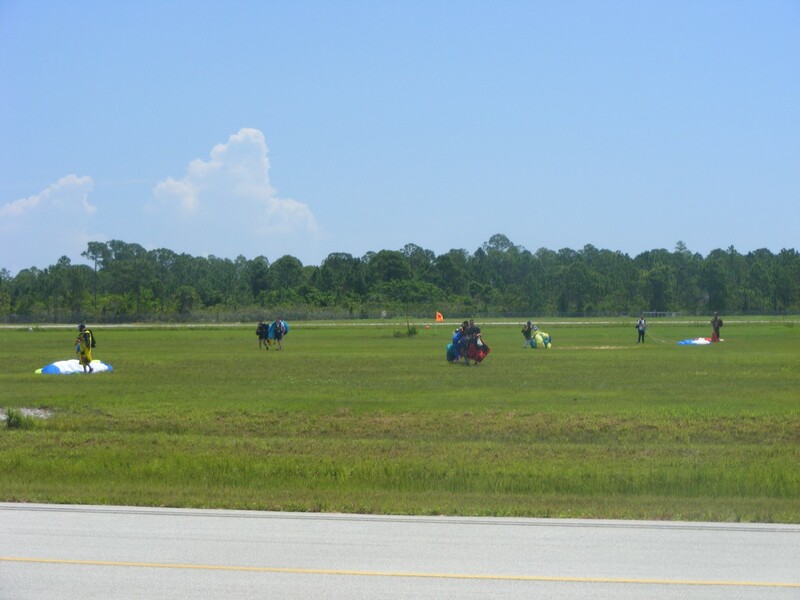 This wide shot shows the jumpers on the ground and the jump plane after it landed and is coming back to the ramp near where I am parked. Here is view that shows the windsock for the airport at the left edge of the image and some other buildings on the other side of the air field. 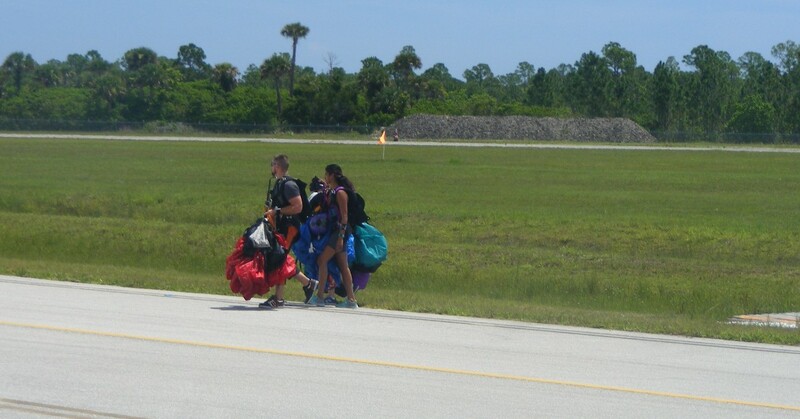 The jumpers are gathering their parachutes and heading to the tent where they repack them for the next jumps. 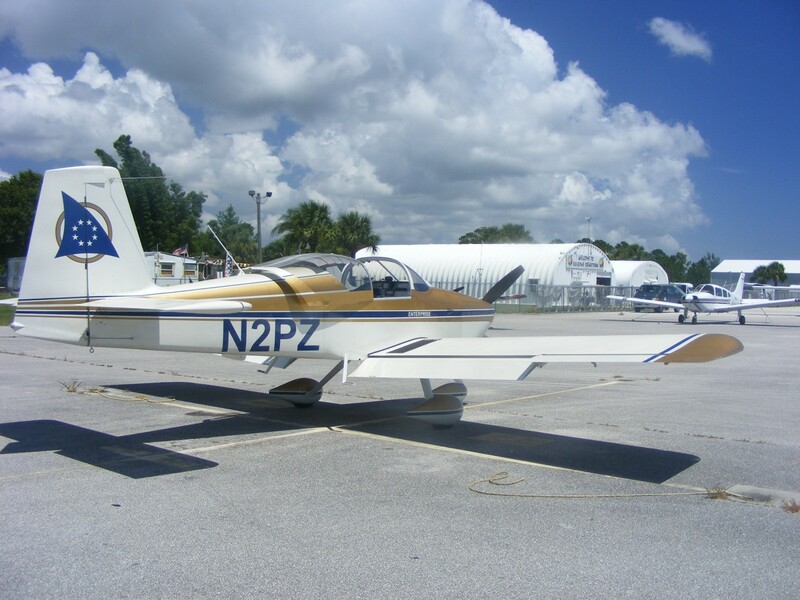 The jump plane is a Cessna 208B with a turbo prop engine up front driving a three-blade propeller. The discussions are full of adrenalin as each jumper shares their jump with their friends. 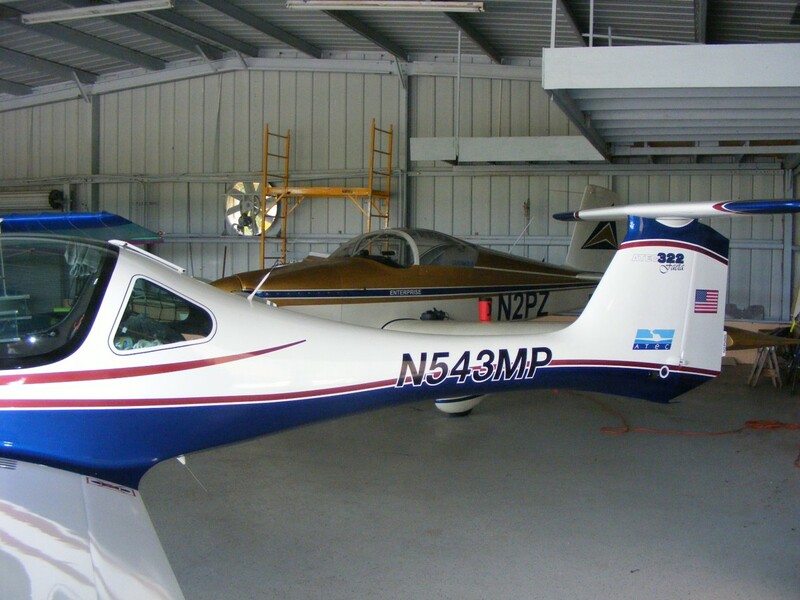 The door is removed to make it easy to exit the airplane when they are up at 14,000 feet. 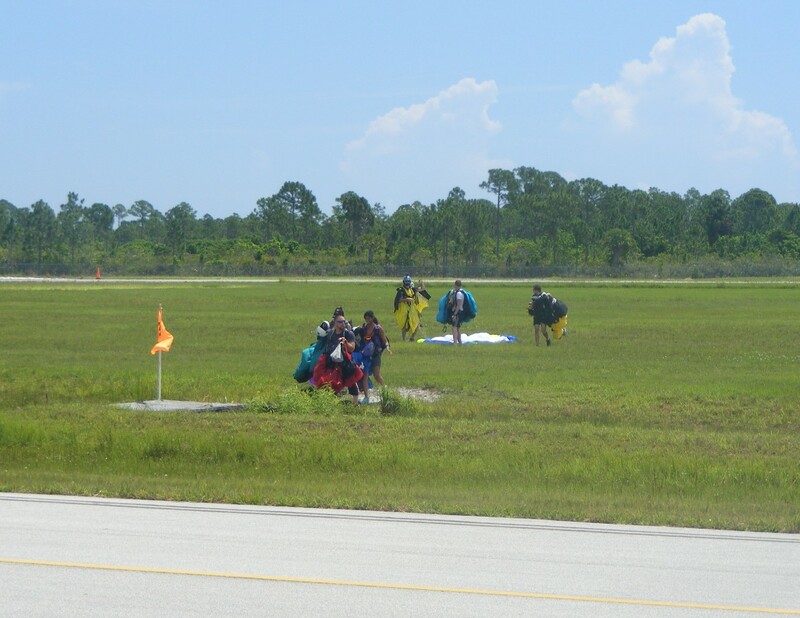 With the temperature down here at 90 degrees, the jumpers quickly remove their jump suits after they land. It is a lot cooler at 14,000 feet, and the wind chill factor when falling at 120 MPH can be uncomfortable. 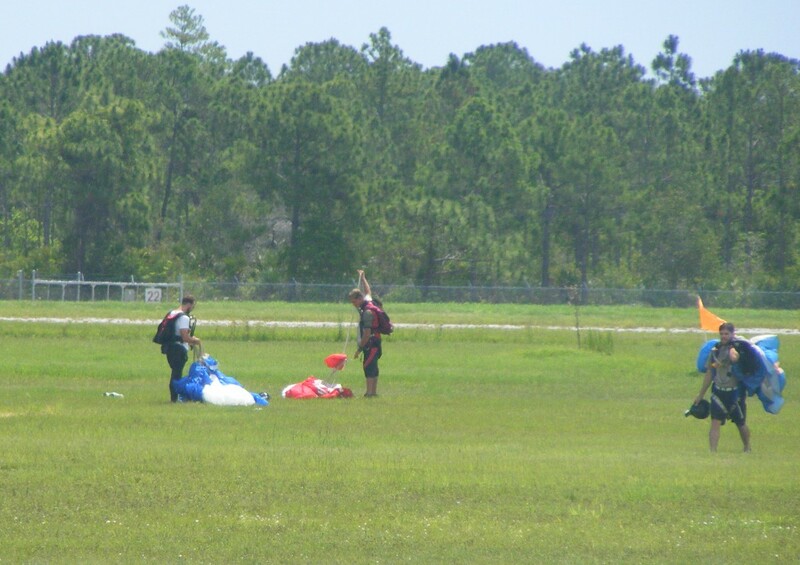 The bulky suits also keep them from falling too fast before the parachute is deployed. When inflated, the parachute canopy acts as a wing and allows them to be steered to a specified landing spot. I pushed the zoom lens to catch these guys at the far side of the landing zone getting ready to walk back. 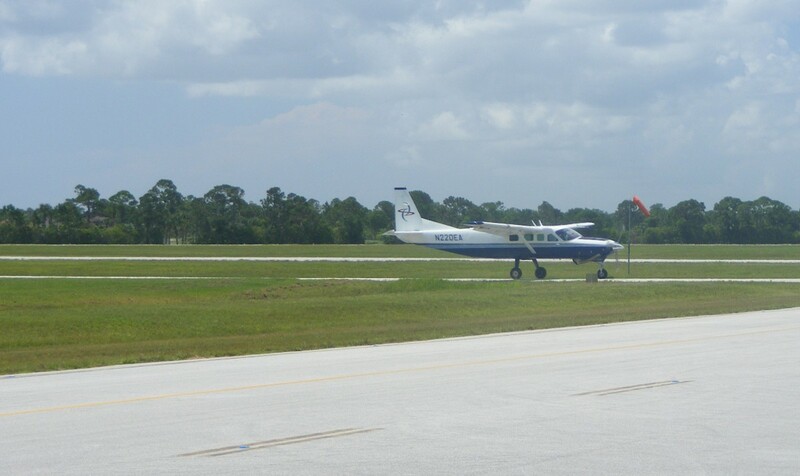 Since this is my first time at the Sebastian Airport, I have taken the usual ramp photo near the fuel tanks. Here is the view looking at the parachute jump school and support facilities. I was watching the next wave of jumpers landing while I was preparing to start my engine for departure. I noticed one of them had a "flying suit" with fabric between the pants legs. When a jumper wears one of these suits, his suit acts like the tail on most birds as he moves his legs. 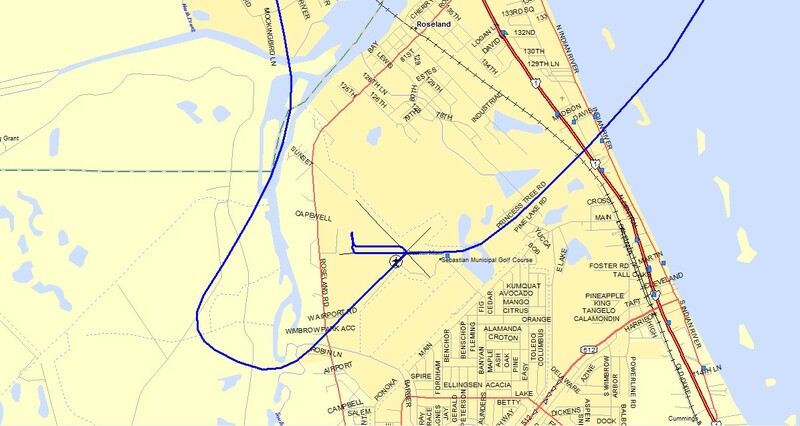 Here is the GPS ground track arriving from the north using runway 5 and departing to the northeast from runway 10 at the Sebastian Airport. There was a sign by runway 10 for pilots to immediately turn on a heading of 060 degrees soon after takeoff for noise abatement by avoiding populated areas.